You have to kiss a few frogs….or rather, into every quilter’s life some ripping must fall. Try as we might, there will always be days when we spend way too much time ripping stitches out (for you newbies, that is frogging = ripping, as in RIP-it, RIP-it). It takes 3-10 times longer to remove stitches than it does to make them. For this reason, it is really important to have a sharp seam ripper for the job. Don’t try to do this job with your grandmother’s antique seam ripper from 1906. You need something with a fine and very sharp blade, particularly if your stitches are small. It is nice to have a slight curve to the blade–I find it helps to keep you from ‘stabbing’ your fabric as you remove stitches. My current favorite is from Superior Threads. At $30 it is a bit pricey, but lasts much longer than the cheaper ones…. 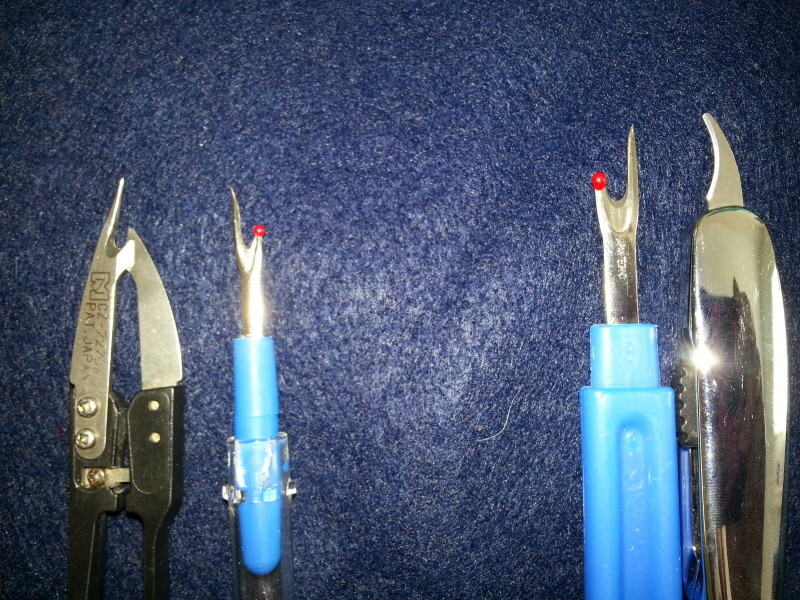 The 2 seam rippers on the left work best for ripping out stitches. The other work to cut thread.